The Metal Gear Solid movie has found a writer. Guillermo del Toro’s plans for a Pinocchio movie are dead. A Stranger Things star could be headed to Narnia. Plus, new footage from Coco, Chadwick Boseman on Black Panther’s tech-genius sister, and The Flash’s Elongated Man in costume. Spoilers, go! 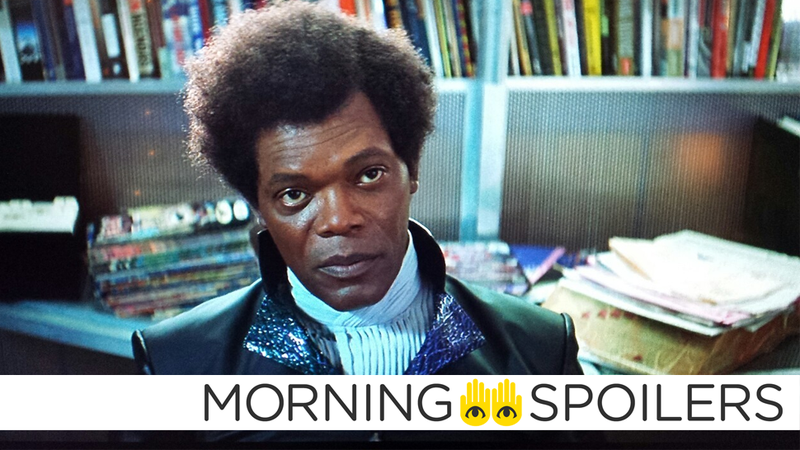 The Daily Mail has set pics of Samuel L. Jackson in full costume as Mr. Glass. Variety reports Derek Connelly (Jurassic World) has been hired to write the script for Hollywood’s adaptation of the legendary tactical espionage video game franchise. Guillermo del Toro has confirmed his stop-motion Pinocchio is officially canceled. It’s not happening. But the idea was to do Pinocchio during the ascension of fascism in Italy, with Mussolini. It was a good time to discuss the idea of being a puppet or being a human, but you know, it’s not in progress. That Hashtag Show reports Millie Bobbie Brown has been offered the role of Jill Pole in the latest Narnia film. Entertainment Weekly has confirmed Princess Jasmine’s tiger, Rajah, does indeed appear in Guy Ritchie’s live-action Aladdin, after rumors emerged that Jasmine’s beloved feline companion would be absent from the film. Moreover, Naomi Scott revealed to THR that Jasmine will also enjoy the company of a new confidante, a handmaiden named Dalia. I never realized it, but in the animation, Jasmine is really the only female character — isn’t that crazy? The Dalia character is so important to this movie because she’s the only other female character. She may be the handmaiden but they’re best friends; they’re so close because they’ve grown up together. So we wanted people to watch the movie and see Jasmine’s relationship with another woman, and be like, ‘Ah, that’s what I’m like with my girlfriend,’ or ‘We would so do that if I was in that position.’ That’s something that’s missing from the animation. Dwayne Johnson confirmed on Twitter that Adam Sztykiel is indeed writing the Black Adam movie. Chadwick Boseman hyped the awesomeness of Shuri in a recent interview with CNET. If anyone doesn’t think there’s a place for women in tech, it’s completely demolished in this movie. Her role is the most important. In the comic book, T’Challa is a scientist and a king, but my sister is the whiz kid. She is the one with that gift. She’s the Tony Stark of Wakanda. She’s witty, she’s cool, she’s funny. Now T’Challa is good in science too, but she’s the whiz. That’s the way the story’s been told forever. T’Challa is technologically sound. He’s a scientist as well, but she’s the minister of technology. Here’s the cast and crew of the film in an extended sit-down interview with the press, courtesy of Collider. Bureaucracy lingers long after death in a new clip. Coming Soon has a new poster of the film’s orc/cop duo haloed by a red cosmic energy that’s easily mistakable for arterial spray. Deadline reports Laura Mennell will play the ‘50s-set Roswell UFO show’s currently undisclosed female lead. Vincent D’Onofrio is currently prepping for his return as Wilson Fisk. Following her breakout performance as Amunet on this week’s episode of The Flash, Katee Sackhoff confirmed to Cinema Blend she’ll be reprising her role in multiple episodes this season. I’m back in [Episode] 9, I’m back in 12 and 13, and potentially 14. I’m basically sort of, I get phone calls like, ‘Does [Katee] want to come back for a few days?’ And if I’m available, it’s sort of like ‘Sure!’ And that’s sort of just how the character’s gonna keep evolving.